The flow of air in and out of the alveoli is called ventilation and has two stages: inspiration (or inhalation) and expiration (or exhalation). To accomplish this, the whole thorax moves and changes size, due to the action of two sets of muscles: the intercostal muscles and the diaphragm. These are the muscles that are strengthened by using the Expand-A-Lung Breathing Resistance Exerciser. In essence, you inhale more oxygen, and you exhale more carbon dioxide. The result is a substantial improvement in shortness of breath and endurance through better breathing. All is done naturally, with the help of the Expand-A-Lung Breathing Resistance Exerciser. 5 year unlimited warranty for parts and labor. SELECTED THE #1 CHOICE OF THE L.A.TIMES REVIEW! - RANKED ABOVE ALL OTHER RESPIRATORY FITNESS TRAINERS AND ELEVATION TRAINING MASKS! - FEATURED IN THE FOLLOWING MAGAZINES: RUNNER'S WORLD, TRIATHLETE, TRIATHLON CANADA, AUSTRALIAN TRIATHLON & MULTISPORTS, VELO NEWS CYCLING, FREESURF HAWAII, SKIN DIVER, HAWAII SKINDIVER, INTERNATIONAL FREEDIVING, THE BOX (CROSSFIT), BLACK BELT MARTIAL ARTS. INTERNATIONAL KICKBOXER. Brand: Expand-A-Lung | Manufacturer: Expand-A-Lung, Inc.
Voldyne 5000 Volumetric Exerciser consists of a large volume measurement and advanced low-work-of-breathing filter. Its compact, ergonomic design with built-in handle has gradations on both sides of unit and good/better/best flow window for visualization of daily improvement. Single-patient use. Large volume measurement and advanced low-work-of-breathing filter. Compact, ergonomic design with built-in handle. About your Peak Flow Meter: A peak flow meter is a handheld device that measures how well air moves out of the lungs. It checks how fast air leaves the lungs when you blow forcefully and you fully inhale. Keeping track of peak expiratory flow helps you know if your respiratory symptoms are worsening or not. This meter was designed to make following your respiratory treatment plan easy. Your health care provider will se the color zone indicators to your personal zones based on your personal best peak flow rate value. (The best peak flow value you can achieve on a good day when your symptoms are under control). The AsthmaMD peak flow meter is a single patient use device to measure a patients's peak expiratory flow rate in liters/minutes. this measurement is helpful in managing respiratory conditions such as asthma. The device is intended for use by patients requiring the measurement of peak expiratory flow rates. We have provided a free downloadable tracking App for accurate monitoring of your asthma. However, if you're not able to access AsthmaMD app, we have provided a convenient paper log. STRENGTHEN your respiratory muscles with this lung exerciser. Works both your inspiration and expiration muscles and helps increase your level of activity and exercise. Very effective in asthma and building stamina. AsthmaMD App: We proved a Free app for accurate monitoring of your asthma. Manually enter the highest of your 3 readings. You can email your log to yourself or your doctor. Created by a Doctor for Better Asthma Control. Includes Full Range Peak Flow Meter, Instructions, Paper Asthma Log, and Free Download Tracking App. Easy to use, clean, carry and store. Respiratory meter means "measuring of breath", is a routinely used pulmonary function test (PFT) that measures the amount and speed of air that a person can inhale and exhale. An incentive respiratory meter is a medical device used to help patients improve the functioning of their lungs in conditions where lung functions are compromised due to various respiratory disorders such as "atelectasis (small airway collapse), bronchial asthma" etc. It enables the patient to exercise his/her lungs without any stress. Brand: Wonder Care | Manufacturer: Surgifab Trading Corp.
Why should you purchase this item? Because it's the device that will help you grow your potential by reducing fatigue and improving cardiovascular endurance. Comfortable, portable and easy to use, the breathing fitness exerciser is the ultimate device to enhance inspiration and expiration intensity. Some of the amazing features of this product: The premium breathing fitness exerciser will help you increase your endurance a The mouth piece is made with flexible medical grade silicone for more comfort Additionally, the device can be used for elevation training It has an adjustable resistance valve that will help stegnthen your diaphragm muscle The device is portable and travel-friendly, measuring no more than 4" The respiratory exercise is made in the USA, following strict standards You are backed by a 60-day money-back policy ADD TO CART NOW and increase your endurance with the amazing lung exerciser! PORTABLE: Our lung breathing trainer is extremely compact, measuring no more than 4. It is pocket-size, so you can perform your daily 7-minute training wherever you are, at home, at the gym or while traveling. This technique is so good, even navy seals use it! 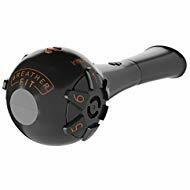 CUSTOMER SATISFACTION: We believe in the quality and performance of the breather exerciser. 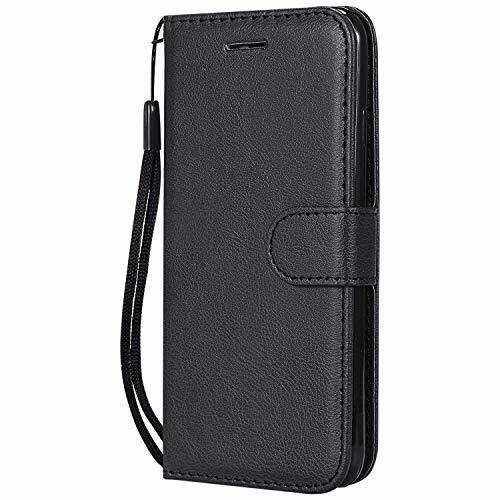 However, we care about all our customers, so if you have any issue with our product, you will receive a full refund within 60 days of the purchase. BREATHE EASY WITH BREATHER FIT! The Breather Fit is a drug-free evidenced based Inspiratory/Expiratory Respiratory Muscle Training (RMT) device used by and recommended by athletes, fitness enthusiasts, singers, musicians and competitive sports persons. It trains both inspiratory and expiratory muscles independently. LET BREATHER FIT BE PART OF YOUR HEALTHIER, FITTER LIFE! Breathing against resistance during respiratory muscle training (RMT) activates and strengthens respiratory muscles and improves health and quality of life by promoting regained activity and exercise tolerance. RMT was also shown to improve the blood flow to resting and exercising limbs, delaying the metaboreflex, thereby improving exercise capacity and endurance. Strengthening your respiratory power by RMT can greatly contribute to improving exercise capacity and peak performance - and may just provide that little, but crucial advantage in professional sport. Studies have shown that respiratory muscle training (RMT) improves oxygen uptake, VO2max and ventilatory efficiency, improving aerobic fitness. For best results, do two sets of 10 reps, twice a day, 6 days per week. It may take up to 4 weeks to feel results, though the deep, slow breathing is known to almost immediately assist in relaxation. RESPIRATORY MUSCLE TRAINER: Think of the Breather Fit as a Gym for your lungs. Exercise your lungs and breathing muscles. INDEPENDENT DIAL SETTINGS: Exercise your inspiration and expiration muscles independently with adjustable and independent pressure settings. LIGHTWEIGHT, PORTABLE DESIGN: Strengthen your respiratory muscles, increase your level of activity and exercise on the go. Easy to use, clean, carry and store. DRUG FREE, SCIENCE BASED: Regular respiratory muscle training (RMT) will improve your exercise capacity and performance, whether you're an athlete, a sedentary or healthy person. Brand: Breather Fit | Manufacturer: PN Medical Inc.
Do you ever feel a shortness of breath from simply walking up a flight of stairs? Would you like to gain better lung stamina during vigorous workouts? Now, thanks to the Ultrabreathe, you can relieve the symptoms of breathlessness by giving your lungs a daily workout from the comfort of the armchair. Just inhale through Ultrabreathe for a few minutes twice a day in a simple breathing pattern as shown in the instructions. Ultrabreathe works on the principle of resistance. As you inhale, the resistance created makes your respiratory muscles work harder, and the harder they work the stronger and more durable they become. As your breathing power improves, Ultrabreathe can be gradually adjusted to provide more resistance with just the twist of a knob. It can even help reduce the feeling of breathlessness from some lung diseases such as asthma, bronchitis and emphysema. Doctors have been prescribing big, bulky breathing devices for post-surgery patients to increase their lung power for years. Ultrabreathe gives you the same effects, but is so small and compact you can take it with you to exercise your lungs wherever you are. Whether you re exercising for cardio fitness, sports or not at all, you ll breathe deeper and more easily than ever. Within a month you will be on your way to feeling the wonderful effects of strong, healthy lungs! 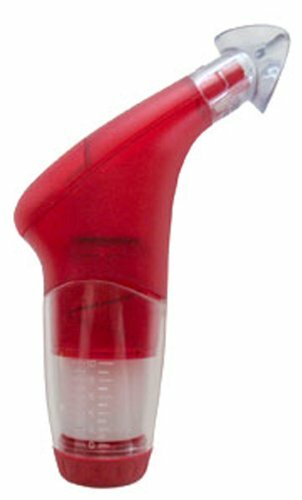 POWERbreathe Plus 2 Fitness model, with improved airflow dynamics, ergonomic design, comfortable antibacterial mouthpiece (protects against bacteria such as E.Coli and MRSA), soft-touch nose clip, easy-to-read resistance level indicator. 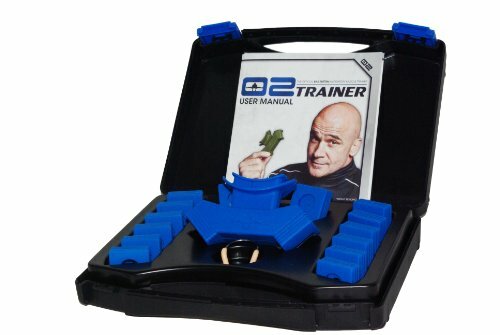 This item is NON-Returnable POWERBREATHE A revolutionary and versatile inspiratory muscle trainer and strengthener. POWERbreathe assists one of the most important components in your daily life - your lungs and breathing. By breathing in through POWERbreathe for only 30 breaths twice daily, your inspiratory muscles will work harder, thereby increasing their strength and endurance. This patented device has been proven by extensive research and testing and has been used by sports teams, professional athletes, respiratory therapists, fitness centers, fire departments, sports medicine facilities, etc. POWERbreathe is now available in the US for the first time. It is an easy to use, drug free, hand held device with a comfortable mouthpiece. POWERbreathe is available in sereral models to suite everyone including those with asthma or other respiratory problems. Comes complete with instruction manual. 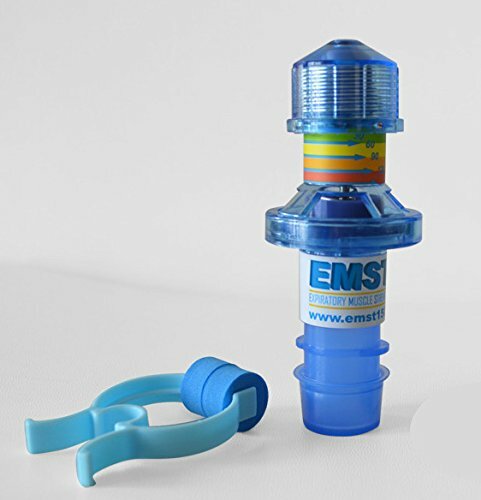 The EMST 150 is the first calibrated expiratory muscle strength trainer designed specifically for individuals who want to enhance their breathing and swallow function. It was created by physiologists who recognized the importance of people with different needs to train muscles involved in their activities and also be able to measure their progress over time. Now those who use the EMST 150 are able to tailor their exercise regime and help achieve results with greater effectiveness and in less time. The EMST 150 is so lightweight and portable that it can fit in your briefcase, purse or gym bag. People of all ages from seniors to baby boomers to Gen X and from elite athletes to golfers and singers can take advantage of the EMST 150 trainer - - wherever you go! The EMST 150 is a calibrated expiratory muscle strength trainer designed specifically for individuals who want to enhance their breathing and swallow function. ChoiceMMed lung trainer is designed for athletes, swimmer, singer who want improve the lung capacity and people suffering shallow breath. 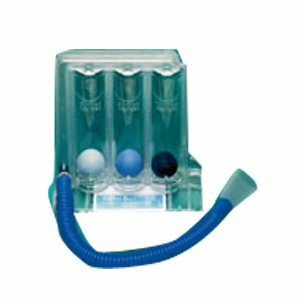 ChoiceMMed Lung Boost respiratory trainer strengthens your respiratory muscles to help you breath easily and breath more. Lung Boost lung trainer is a very simple using device: 1 Power on the device. 2 Chooose the training mode and pressure level by press the button. 3 Use your mouth to breath air with Lung Boost. 4 See your result on the display screen. Compared with other lung training device, ChoiceMMed LungBoost provide two smart training mode: endurance mode and strength mode. Endurance mode is designed to train your lung breath duration time. In this mode, you need to inhale or exhale as long as possible. Your lung effort level will be indicated by the number on the high-lighted ball on the screen. Strength mode is to designed to train your lung physical strength. By choosing this mode, you are required to inhale or exhale as hard as you can. 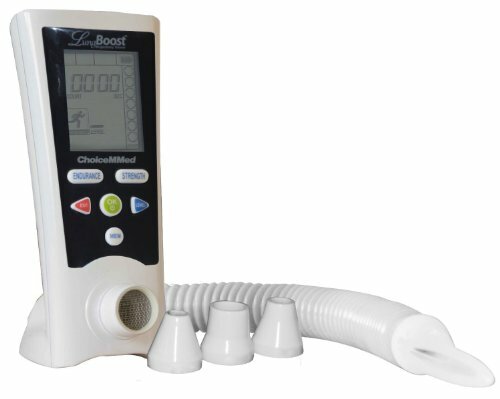 ChoiceMMed LungBoost respiratory trainer has come with additional 3 free resistance cones. Each resistance cone could give 5 levels pressure. Totally LungBoost could provide 20 different pressure level for your choice. By purchasing a additional separate mouth piece, your family member could use one unit at home and save money. The Training Mask is a respiratory resistance device that is designed to increase breathing power and improve breathing mechanics. Training Mask's multi-patented dual channel air flow technology compresses air at the inlets with resistance caps and then adds air resistance via flux valves. Training Mask will help you improve breathing power and breathing technique. The lightweight and comfortable design of Training Mask makes it a perfect addition to almost all exercise routines. The Training Mask is used by professional athletes in all sports all around the globe. Super Bowl Champion and All Pro Running Back Marshawn Lynch says: "I came home one day to get some training in and one of my friends told me to try TrainingMask. So I ran a lap around the building where we train at and about half way through the lap I had to stop and take the mask off for a minute. I was thinking to myself 'Man this is a little different than I was expecting'. But after three days of working out with it I started to notice my wind was getting that much better and I was like 'It Works'." However its not just the pros that trust Training Mask. Regular people chasing after their own fitness and athletic goals love the Training Mask as well. Amber from NV says: "I just started going to the gym 5 days a week for the past 8 weeks. The Training Mask has been a great tool that has really helped me boost my progression!" Get real results with the REAL Training Mask today and take your workouts to a whole new level. We are the Real Training Mask - We have pioneered and have become the leader in performance breathing devices. Genuine TrainingMask breathing exercise devices were engineered to apply variable levels of tension to the breathing muscles by controlling air flow which increases tension on your breathing muscles. Don't be fooled by the knockoffs - The REAL Training Mask does it best. Burn the Fat - Build the Muscle - It's not all about endurance and stamina - the Training Mask has been scientifically proven to increase your body's growth hormone levels by up to 25% with exercise. Increased growth hormone will help you burn more fat, build more muscle, and recover faster after a tough workout. Build Stamina for the Long Run - Using the Training Mask in your workouts will decrease the impact of fatigue in your training sessions by increasing your threshold potential, activity strength at exhaustion, and stamina. More stamina and endurance make the hard workouts EASIER. How do our Training Mask's Work? Training Mask Original Series masks uses patented multi-level resistance which loads the respiratory muscles by adding friction to inhaled air. Increasing your breathing load while working out is like lifting weights for your breathing muscles. More breathing power will supercharge your stamina and endurance. The Training Mask Original Series include: 6 Resistance Caps, 3 Flux Valves, Head Strap, Manual, and a 3 YEAR WARRANTY with Product Authentication. The Training Mask is a respiratory resistance device that is designed to increase breathing power and improve breathing mechanics. Training Mask's multi-patented dual channel air flow technology compresses air at the inlets with resistance caps and then adds air resistance via flux valves. 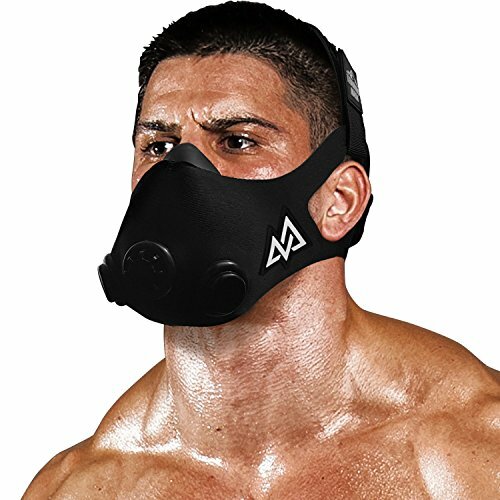 Training Mask will help you improve breathing power and breathing technique. The lightweight and comfortable design of Training Mask makes it a perfect addition to almost all exercise routines. The Training Mask is used by professional athletes in all sports by athletes all around the globe. Super Bowl Champion and All Pro Running Back Marshawn Lynch says: "I came home one day to get some training in and one of my friends told me to try TrainingMask. So I ran a lap around the building where we train at and about half way through the lap I had to stop and take the mask off for a minute. I was thinking to myself 'Man this is a little different than I was expecting'. But after three days of working out with it I started to notice my wind was getting that much better and I was like 'It Works'." However, it's not just the pros that trust Training Mask. Regular people chasing after their own fitness and athletic goals love the Training Mask as well. Amber from NV says: "I just started going to the gym 5 days a week for the past 8 weeks. The Training Mask has been a great tool that has really helped me boost my progression!" Get real results with the REAL Training Mask today and take your workouts to a whole new level. The Ultrabreathe is a highly effective inspiratory/expiratory muscle trainer, providing an easy and convenient means of increasing the strength and durability of the respiratory muscles. It works on the principle of resistance. As you inhale, the resistance created makes your respiratory muscles work harder, and the harder they work the stronger and more durable they become - and as your breathing power improves, the Ultrabreathe can be gradually adjusted to provide more resistance. The Ultrabreathe device is patented, CE marked and manufactured in the UK to exacting European health & safety standards. With hundreds of thousands of users worldwide. The Ultrabreathe works on the principle of resistance. As you inhale, the resistance created makes your respiratory muscles work harder, and the harder they work the stronger and more durable they become - and as your breathing power improves, the Ultrabreathe can be gradually adjusted to provide more resistance. Used correctly, the Ultrabreathe can be used by almost everyone and has no harmful side effects. Very occasionally, however, there may be instances in which the creation of large negative pressure in the chest may exacerbate an existing condition. If this happens advice should be sought from a Physician. If you are taking medication, suffer from a medical condition, (Asthma/COPD for example), or are uncertain as to whether the Ultrabreathe is appropriate for you, then you should consult your Physician prior to commencing training. Above all, unless advised by your Physician you should not stop taking any medication - The Ultrabreathe is intended to complement existing treatments, not replace them. Adjustable over a wide range of resistances making it suitable for users at all fitness levels. 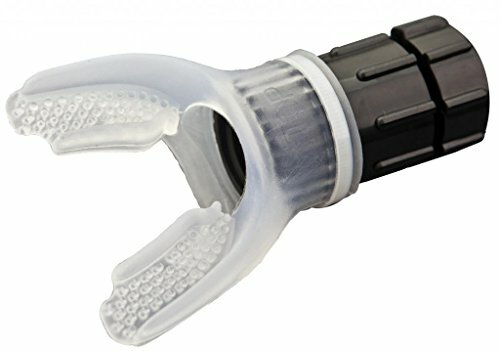 POWERbreathe Sports Plus 3 model, with improved airflow dynamics, ergonomic design, comfortable antibacterial mouthpiece (protects against bacteria such as E.Coli and MRSA), soft-touch nose clip, easy-to-read resistance level indicator. 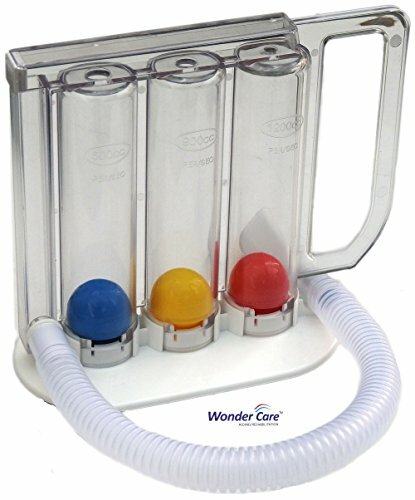 This item is NON-Returnable POWERBREATHE A revolutionary and versatile inspiratory muscle trainer and strengthener. POWERbreathe assists one of the most important components in your daily life - your lungs and breathing. By breathing in through POWERbreathe for only 30 breaths twice daily, your inspiratory muscles will work harder, thereby increasing their strength and endurance. This patented device has been proven by extensive research and testing and has been used by sports teams, professional athletes, respiratory therapists, fitness centers, fire departments, sports medicine facilities, etc. POWERbreathe is now available in the US for the first time. It is an easy to use, drug free, hand held device with a comfortable mouthpiece. 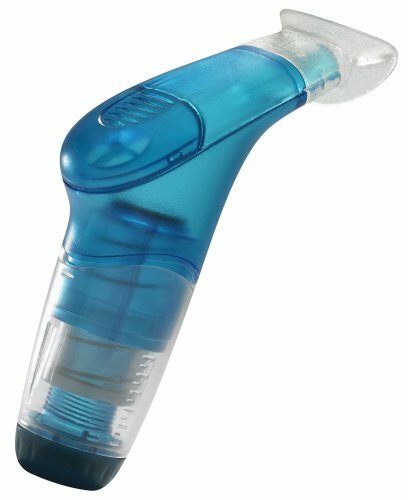 POWERbreathe is available in sereral models to suite everyone including those with asthma or other respiratory problems. Comes complete with instruction manual.